Since this version, Photopea uses custom cursors for some tools. We have hand cursor for Hand tool, plus and minus cursor for Zoom tool and arrow cursors for resizing rectangles (Free Transform, Crop, Type tool). Brush-like tools (Brush, Eraser, Clone Stamp) have cursor as a contour of current brush. Unlike classic layer, which has a constant pixel data, smart layer has fixed source (JPG file, PSD file ...) and pixel data can be regenerated at any time from that source. After transforming layer to be 10x smaller and then transforming it back, making it 10x bigger, classic layer loses precission, becomes pixelized. Smart layer does not, because its content is regenerated from original source file. Another advantage of smart layer is, that we can have multiple smart layers with a same source (e.g same snowflake at different positions and sizes). 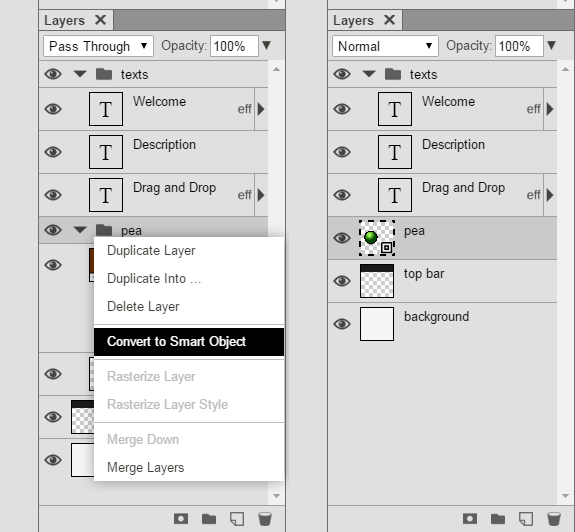 After editing a source (doubleclick, editing, File - Save Smart Object), all smart layers that use it are updated.